The phrase “Let It Pop” circles the tin of specialty popcorn I received today in my company white elephant gift exchange. This play on the phrase “Let It Snow”, is a product of the Pittsburgh Popcorn Company. 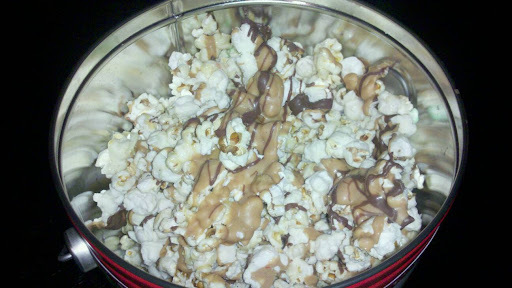 The mixute I received is kettle corn covered in a peanut butter and chocolate drizzle. Even though I was vying for a bottle of wine in the exchange, instead of satisfying my appetite for wine, my sweet tooth is jumping for joy at the outcome. It is a sweet delicious mixture that would actually go well with either hot cocoa or a nice glass of red wine. The Pittsburgh Popcorn company has a fairly new location in downtown Pittsburgh on Liberty Avenue, on the border of the cultural district. So if you need an after lunch snack and agree that ’tis not the season for ice cream, then stop by and let me know what this lovely mixture I’m eating is called. I didn’t need to receive any more wine today, so the popcorn is great. I have plenty of bottles from my purchases this week. For the first time ever, I can report that my wine fridge is completely full! Cheers.